The cloud era is coming. Some people can argue whether this is good or bad. Maybe that’s only the fashion. Maybe not. Although more and more people think of the cloud as if it were the inevitable future. That’s why cloud-oriented operating systems come into play. What are the most widely-known of them? I can name three from the top of my memory: Chrome OS, xPud and Peppermint OS. Let’s talk about Peppermint OS today. Their latest release was issued at the end of July 2012, when Peppermint OS Three was presented. You can download the ISO image of this operating system either from one of four mirrors, of from the torrent. I used the latter option to get my own image of Peppermint OS Three 32-bit. The distribution ISO image size is only 554 Mb. I used Unetbootin to "burn" the image onto the USB stick. When it was ready, the time to reboot my Fujitsu-Siemens Amilo Pi 1505 laptop had come. Choose to boot from the USB. Let's go! The boot menu of Peppermint OS Three was no different from many others created by Unetbootin. It had options to boot the Live version of Peppermint OS, to do the installation, to check media or to boot from the HDD. My choice was for a Live run of Peppermint OS Three. The boot process itself was rather quick. No additional questions were fired into my face. At the end of the process, the desktop appeared in front of me. The freshly booted Peppermint Three operating system took about 145 Mb of memory, which is more than, for example, ROSA 2012 Marathon LXDE, but less than Zorin OS 6 Lite or WattOS R5. The core of this Peppermint Three operating system is Linux kernel 3.2.0-23. There is an LXDE desktop environment on top of generic GNU/Linux components. The desktop in Peppermint OS Three has the classical LXDE layout with a panel at the bottom of the screen. 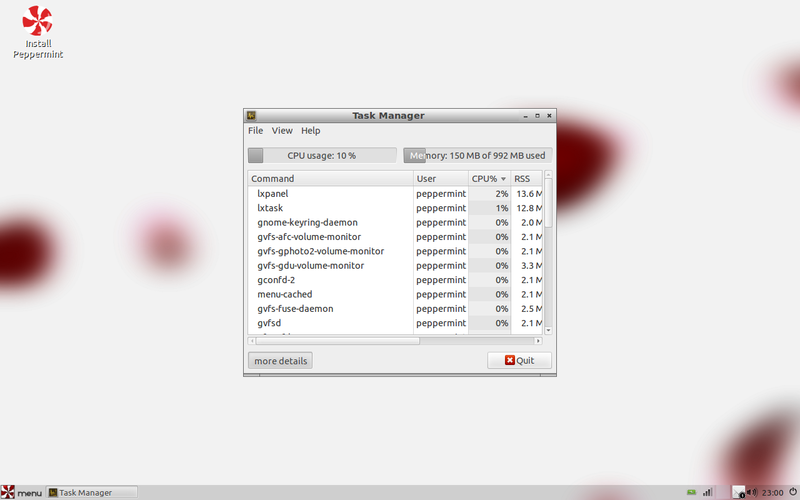 The default wallpaper is white with some red spots and with Peppermint OS logo at the centre. There is only one icon on the desktop: Install Peppermint. If you do not like the default wallpaper, there is a choice of about half a dozen alternative images, most of them with the Peppermint OS theme. The panel at the bottom of the screen has a notification area in the bottom-right corner, where you can find some usual stuff: battery status, network monitor, volume control, clocks, and a session management button. This panel has two issues, from my point of view. First of all, there is an empty space between the elements. Second, like in Linux Mint Cinnamon and MATE, the battery monitor is the only green element between black-and-white icons. The left part of the panel has only one element: the menu button with the Peppermint logo on it. The task bar takes the rest of the panel. You will notice there is neither a Show Desktop button nor a Virtual desktop switch in the default Peppermint OS desktop layout. However, these elements are available in the panel configuration, which is accessible via right click anywhere on the p<screenshot>anel. The panel itself has some transparency, so you can see elements of the background on it too. Being based on Ubuntu 12.04, Peppermint OS Three had no issues with configuration of my wireless network card Intel 3945ABG. My network was listed when I clicked the network manager icon in the notification are. After the usual ritual of clicking and typing, I was connected to my network. Unfortunately, LXDE-based distribution Peppermint OS does not allow you to easily switch between different keyboard layouts, as I am used to doing. Only one layout is available at a time. The only option to switch is via Keyboard Layout in Preferences. Of course, this method is not good for on-the-fly switching. Applications are the most interesting part of Peppermint OS, naturally. The reason is that this distribution is cloud-oriented. It means that many usual applications are replaced with cloud-based alternatives. Other elements of the Internet section in the Peppermint OS menu are Transmission torrent client, Dropbox and IRC clients, links to Peppermint on-line documentation and user forums, and also a tool called Ice. This is a Peppermint OS signature app, which can convert, or wrap, any cloud-based application or service into the local "application". I would compare it with the "Application shortcut" feature of Chrome and Chromium browsers. As you can notice, there is no messaging client or e-mail client in the Peppermint OS. Why? You're right: do it in the cloud! GTalk and GMail are waiting for you, although I'd prefer a local messaging client with more protocols than simple GTalk’s jabber. Office tools are represented by mostly Google applications: GMail, Google Calendar, Google Reader and GWOffice, which is a wrapper for Google Docs. Strangely enough, when I launched GWOffice, I was asked for the password to my Google account twice: once in the GWOffice interface, and then in Google's own distinct interface. The reason for this is not known for me, but, not being a paranoid, I suspect something wrong here. The only non-Google application within the Office section of Peppermint OS Three's menu is the Document viewer tool. By the way… I tried to use GWOffice to see what it is like. It worked fine when I opened a brand new document. But, unfortunately, it failed to open a very basic ODS spreadsheet from my local computer. Oooops, that's a bug and a show-stopper, isn't it? The Graphics section of the Peppermint OS menu includes the same Document viewer, plus Simple Scan tool, plus three pixlr-based applications: Editor, Express-editor and Pixlr-o-matic, which is a competitor to the famous Instagram in the sense that it can also apply nice effects to your images. The Sound and Video section of the menu includes only two applications: GNOME MPlayer as "Media player" and Guayadeque as "Music Player". Never heard of the second tool? That's not the most widely known media player. Maybe for a reason, more on that later. The Accessories section of Peppermint menu includes a more or less standard set of applications: file manager PCManFM, disk utility, character map, Image viewer, Screenshot, terminal, Gedit text editor. Here I'd like to complain a little. First of all, why is Disk Utility in Accessories? This is a system administration tool, improper use of which can be destructive! Second, why are Screenshot and Image Viewer in Accessories, but not in the Graphics section of the menu? The System Tools part of the menu includes GParted (this is in addition to the previously mentioned Disk Utility), Synaptic package manager, Software Manager, Task manager and some more usual applications. Of course, all the Ubuntu standard repositories and PPAs are available for you from Synaptic and Software Manager in Peppermint OS. Some of PPAs are already activated in the Software Sources, for example Chromium's PPA. I won't list all the other available applications, as the list would be endless. Unfortunately, the PCManFM's built-in network browser did not work for my home network. Moreover, Peppermint OS had the same sickness as some other distributions I've tried recently: Zorin OS 6 Core, Linux Mint 13 Maya Cinnamon and MATE, and even OpenSuSE 12.1 Li-f-e. IP addresses of devices within the local network could not be resolved. It means I had no chance to connect to my fileserver's partition without making changes in Peppermint's configuration files. Just in case, I checked the presence of Samba client smbfs: it is not included in the default distribution of Peppermint OS Three. It means that I would need to install this application too. Unfortunately, Peppermint OS Three comes without MP3 codecs installed. When I tried to listen to an MP3 file from my local hard disk, Guayadeque player gave me an error about missing GStreamer plugins. I tried to download and install GStreamer's Fluendo MP3 plugin from the Ubuntu standard repository. As a result, I received yet another error message from Guayadeque, this time about wrong configuration. Finally, I gave up with this idea. In the meantime, I’d like to note that the interface of Guayadeque is far from intuitive. For example, I have not found a way to open files from within the application. 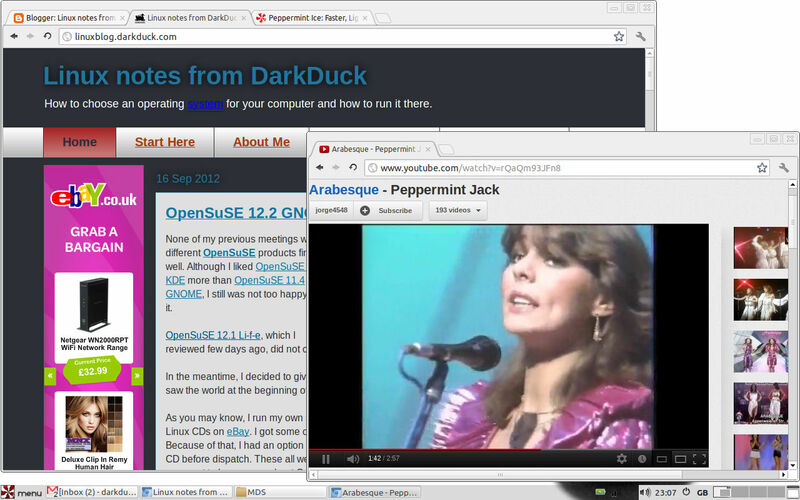 In contrast to MP3, I was able to play Flash videos from YouTube and other sites straight away in Peppermint OS. It means that you have Flash player available out of the box. Peppermint OS Three left quite a contradictory impression on me. First of all, it was terribly fast and quick. You can honestly expect this from an LXDE-based distribution, can't you? But, at the same time, it does not include some major components one would expect from an all-around distribution. I mean an ability to connect to local devices, to play multimedia files and to open local office documents. I think that orientation of Peppermint to the cloud has both benefit and pain, good and evil. That's not the issue of the Peppermint OS itself. It's more about the readiness of cloud-based solutions for our everyday life. The benefit of cloud is clear: you can access the same services, files and documents from anywhere you have Internet access. You don't need to worry about updating of your software: the cloud provider does it for you. But, unfortunately (or luckily, I will let you decide) we still have a lot of stuff which we can only do locally, like store sensitive files, music and so on. The task of an ideal cloud-based distribution would be to blur the line between "local" and "remote", making the jump seamless. This would mean that local and cloud-based services should run equally well. This will be possible in the future, I am sure. Maybe some day the level of cloud services and Linux distributions will be that high. Not today, I am afraid. Have you tried Peppermint OS? What is your attitude to this operating system and to cloud-based services in general? I have to say I'm a big fan of Peppermint. I have set up a laptop running Peppermint with dozens of web applications albeit a lot of them being games. The ICE application is a good tool to organise what are essentially bookmarks under a defined menu structure. The Guayadeque issue with gstreamer is not unique to Peppermint. I had the same issue when installing Bodhi 2 and I was using Rhythmbox. I would recommend using Grooveshark as a web application as it provides access to a huge back catalogue of music. I found that there were lots of applications that are great on the web for doing most of the things we do on a daily basis. Are they better than the desktop applications we are used to? Probably not in most cases. Peppermint 3 is would be one of those handy distributions to have on a pen drive with persistence enabled as an alternative to using portable apps or Puppy. Gary, I suppose you can use Peppermint with persistence for on-the-go solution, but you first need to adjust the system heavily, like your recommended Rhythmbox replacement. In this case Puppy solution looks more attractive to me, because it gives you an option to leave only applications you need, without taking all the garbage with you. It is always hard to argue against the merits of Puppy. It is brilliant. I like the idea, but I found the distro to be buggy. For example, the add and manage user option doesn't work. A few other things don't work. It can't just be me. Anonymous, are you talking about Peppermint or Puppy? Do you mean Peppermint Jack with Sandra & Co from Arabesque? There are not only distro reviews, I try to encapsulate some other articles.